The Pirate Cupcake Baking Company was created out of the sheer love of two things, pirates and cupcakes…how is that NOT a winning combination? We strive to make the freshest cupcakes that remind you of being a kid again. Nothing fancy, just plain, simple, good stuff. We use natural, local ingredients such as eggs and farm stand fruit. We’re also concerned about those folks with allergies and our gluten free friends. 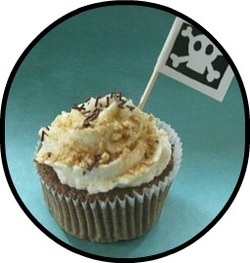 In 2013 the Pirate Cupcake set sail on a new venture, merging the art and the baking to form The Pirate Cupcake Truck! "Clyde", came up from Texas as a plain ice cream truck. With some design help from a few good friends he was transformed into his classic retro look. **And now in 2018 we have added a vintage 1972 mini travel trailer, "Dottie" to our fleet. Dottie came from the heartland of America and is a perfect match to Clyde. She's cute as a button for all of your party needs. We are located in Milford, New Jersey - serving Hunterdon, Warren County and Eastern PA.
﻿We're a peanut and tree nut free bakery!﻿ The Pirate has been highly allergic to peanuts and tree nuts since she was a small child. After two anaphylactic reactions from eating baked goods, we took things into our own kitchen!